Slots in upcoming AGA online simuls on February 27 and March 1 are available to AGA members current through 3/31/2014. Email bobgilman.aga@gmail.com with your AGA ID number and KGS username for access to the room. A schedule is linked in the AGA Community Room on KGS (under “Clubs” in the Rooms List) and in the AGA Tournament Room. “These simuls are a great opportunity test yourself while learning strategy and tactics from a stronger player,” says Gilman. The game is generally followed by a quick review. “Don’t worry about being ‘too weak,’” Gilman adds. The next simul is Thursday, February 27 at 7 pm Pacific time (10p EST), with Dong Ma, AGA 6d, ma2dong on KGS; there’s also one on Saturday, March 1 at 10 pm Pacific time (1a EST) with Ju Zhao, AGA 6d, rainier on KGS. – Tony Collman, British Correspondent for the E-Journal. This weekend’s New Jersey Open (NJO) will be the first Eastern region North American Master’s Tournament (NAMT) qualifier, reports AGA Tournament Coordinator Karoline Burrall. “All players in the top section will be awarded qualifier points based on tournament performance,” Burrall adds. The March 1-2 event in Princeton, NJ is expected to draw one of the biggest fields on the East Coast and also honors Bob Ryder, formerly of Bell Labs and a longtime AGA organizer who held the NJO at Rutgers for many years, with a memorial Beginner’s Prize. Registration Sat. 3/1 9AM-10AM at Frist Campus Center, Princeton University. Click here for tournament details. Top boards will be broadcast live on KGS by the E-Journal. Russell Crowe (left) portrays mathematical genius John Nash Jr. The semi-final game of the World Mind Sports Games tournament. Played between rising star Wang Chenxing and Hei Jiajia (Joanne Missingham). Both belong to the strongest female players in the world today. Get the latest go event invormation. ..which is very versatile, played by humans and robots, to settle, attack, gain territory or to go for influence. Comes with a small trick! – based on the report by David Ormerod and An Younggil 8P on GoGameGuru. 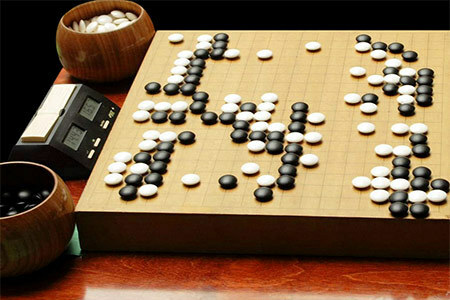 Check their Lee Sedol – Gu Li jubango page for more news and commentary.